1. A local crop consultant recently sent me this picture of prostrate globe amaranth (Gomphrena celosioides). 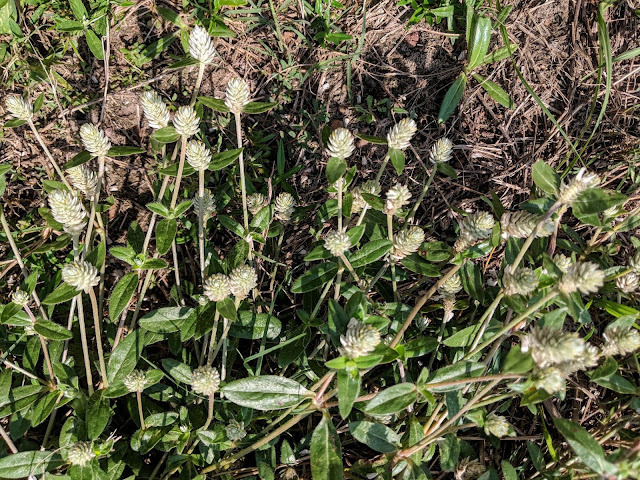 I have never seen this plant before and for the record, Dr. Mark “The Czar” Czarnota (UGA-Griffin Campus) identified it for me. It is a member of the Amaranthaceae (pigweed) plant family. For more general information about this weed, please refer to the following link: here. 2. Had a peanut grower ask me if 2,4-DB applied to large sicklepod plants would have any effect on seed production. A quick review of the literature would suggest that 2,4-DB applications made at the initial flower to peak flower stages of growth will cause significant reductions in the number of sicklepod seed produced. However, applications before or after that time have no effect on seed production (only initial flower and peak flower seed numbers were statisicially different than the NTC-none).